Last year, as I’ve mentioned previously, I spent Christmas and the month leading up to it in Italy as a nanny. While it was a really cool experience (with an awesome trip to Berlin to see my friend and the Christmas Markets! ), I missed my family terribly. This year, I’m so excited to get into the spirit and celebrate the real meaning of Christmas, by giving something of myself. Sometimes I can be a crafty, artsy person, so I was inspired by lots of do-it-yourself projects. However, that being said, I will admit there are lots of DIY things that are neither useful nor practical for the person receiving. This is problematic to me because I think the absolute best gifts are the ones that people can actually use! With this in mind, here are a list of a few things that I think would make wonderful DIY gifts. 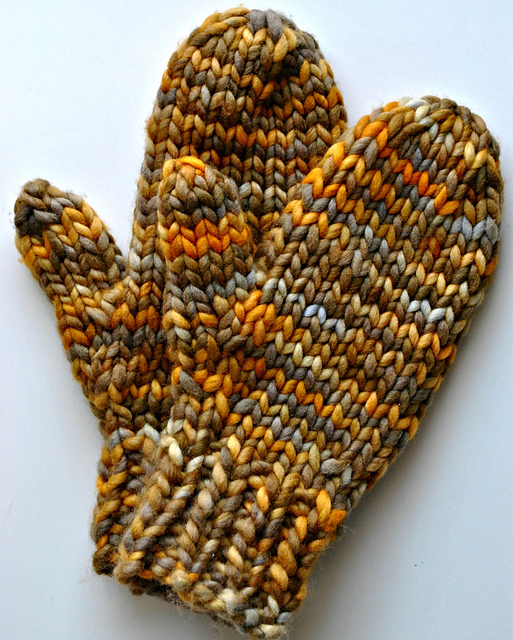 1 – try a simple knitting project, like these really quick mitts. I love the extra chunky yarn, and these are something that will definitely get used. If you’re in a super cold climate (hey, fellow Canadians! ), try using this tutorial on lining them for extra warmth. 2 – Try making homemade Christmas cards. I bought a pack of blank cream and white cards on sale from Michaels, along with some glitter and this Martha Stewart Glue Pen. Using this tutorial from Cupcakes and Cashmere as a guideline, I’ve started making some more festive-themed creations that are sure to put a smile on some lovely faces. 3 – now, normally I find the gifts in a jar to be somewhat redundant; often they’ll be left on the shelf, and forgotten. 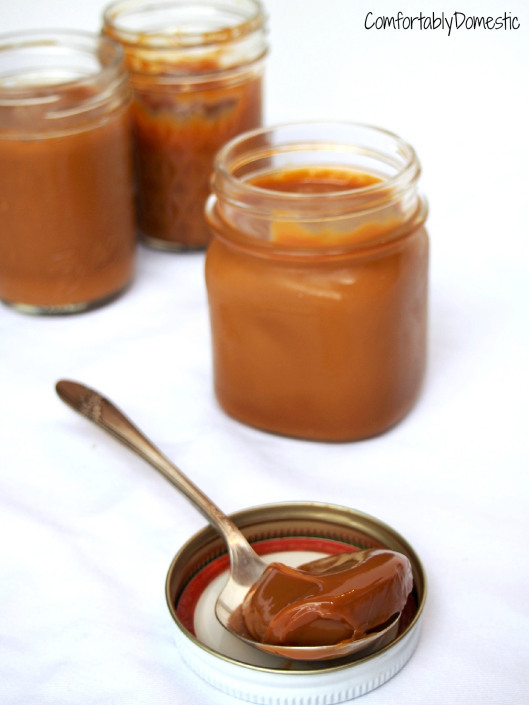 Not so with this homemade dulce de leche, which is perfect as an ice cream topping, cookie sandwich filler, apple dipping sauce, or, simply, to eat with a spoon. The choice is perfectly yours. 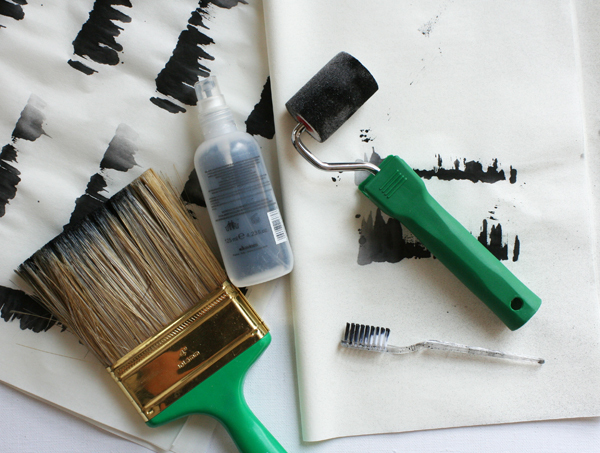 4 – a cool part of the homemade gift process is putting some extra time into the appearance. That’s why I absolutely fell in love with the ideas presented on Oh Happy Day for making some seriously artsy but easy wrapping paper. The best part? You’re not going to find this in store, and it can be made at a fraction of the cost. Art, man. 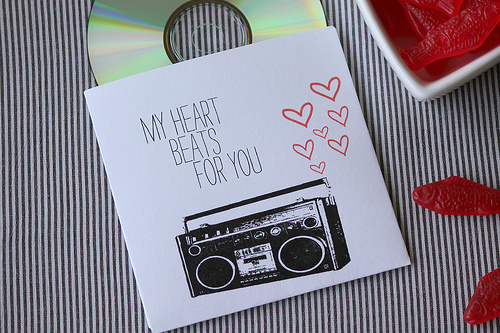 5 – as a big music fan, I absolutely adore making people mix CD’s (people still do that, right?). I spend a lot of time on this gift – researching various songs, bands, lyrics, all to set the right tone and mood for the person I’m giving it to. This is something that can be so personalized, and with the advent of iTunes, it makes it so easy to pick and choose the songs I want to put onto a playlist (without necessarily committing to an entire album). 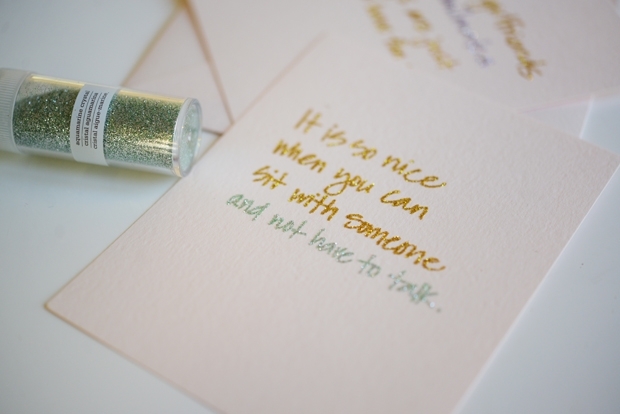 The fun part can be cool sleeves or DIY permanent marker cover art, adding an extra personal touch. Love to give this, love to receive this!! What are your go-to DIY gifts? Do you have a particular ‘theme’ for Christmas this year? That mitten pattern would have come in handy earlier this year, ha. And mmmmm dulce de leche. That looks amazing. If I could, I’d still be making mix TAPES. Now there’s a lost art! Shani, have you signed up for Ravelry? It’s seriously the best pattern website ever, with lots of freebies. Also, YES to mix tapes. I miss those days! Oh! I’m not sure. Lol honestly I’ve just been using it to look up random patterns. Let me check and get back to you. I love the idea of DIY gifts, something about it being homemade that makes it more special! I agree! I always feel extra flattered when someone made something, just for me – whether it’s a scarf in my favourite colour or they took the time to learn my favourite candy bar. Love it all! Yes to that. Maybe we should have a caramel fondue party.